This low carb granola is the most delicious, addicting and crave-able combination of low carb ingredients you’ll ever eat out of a bowl! The best way to start your day — a low carb breakfast you’ll want to wake up for! Make a big batch on Sunday and enjoy this low carb cereal as a quick and easy breakfast, all work week long! 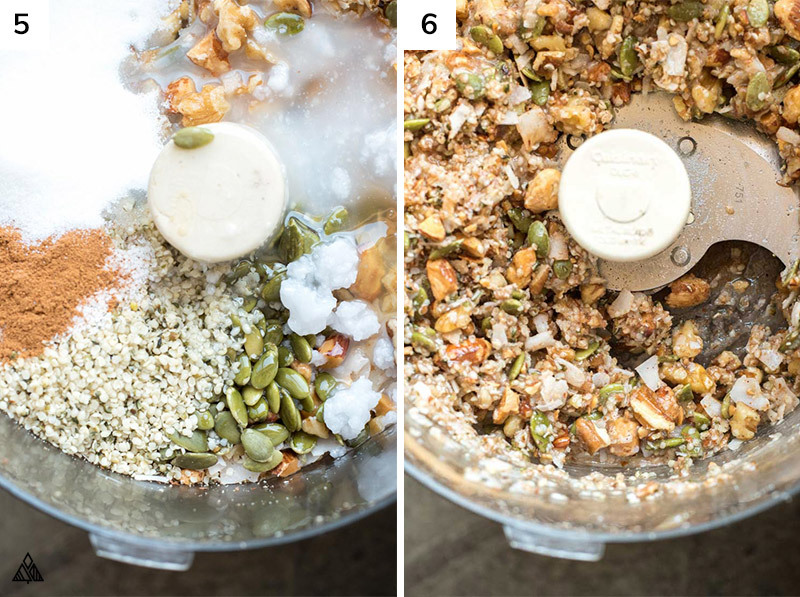 This low carb granola is paleo and sugar free — but that doesn’t mean carboholics wont love it. Cover it in low carb milk or sprinkle it on top of low carb greek yogurt, and I bet you’ll never crave a bowl of that sugar filled stuff again! The not-so-secret ingredient in this addictively delicious grain free granola is a combination of low carb nuts and seeds! 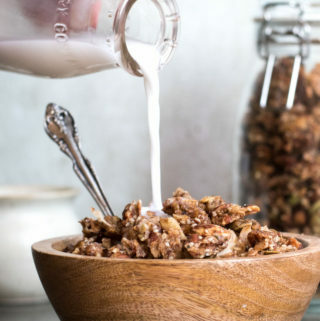 In this low carb crunchy granola recipe, I used my favorite nuts: almonds, walnuts and pecans — feel free to use whatever nuts you fancy. Process harder nuts like almonds first, as they’ll take longer to break down into grain size. The softer nuts, like walnuts and pecans, don’t need to be processed as much. I skipped cashews as they’re the highest carb nut! In 1 oz there are 8.5 grams of carbs, whereas pecans have 4 grams of carbs in the same serving. If you’re curious about the varying amount of carbs in nuts, check out this sortable chart. Those looking for a low carb granola recipe with oats can swap some of the nuts for oats, if that works within your carb count. I don’t add oats to my low carb granola as 1/4 cup of oats adds 25.8 grams of carbs alone — plus I find coconut and nuts to be far tastier! As tasty as the “grains” in this sugar free granola are, the part that makes us all want a second bowl is the sweetness. Enter my low carb sweetener of choice: erythritol. Erythritol is a sugar alcohol extracted from corn. It’s easy on the stomach, and has the same mouth feel as regular sugar. 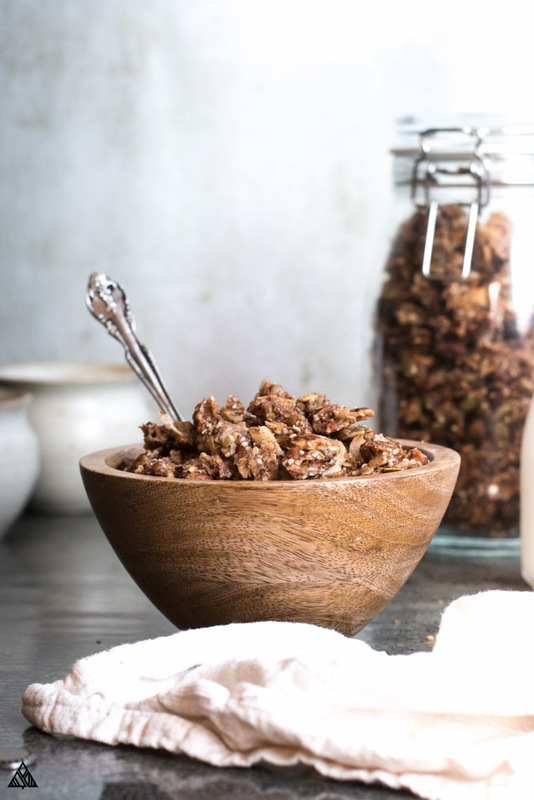 Some notice a cooling effect in the back of the throat when they eat erythritol, but in recipes like this low carb granola, I haven’t heard any complaints! Erythritol can be purchased in both granular and confectioners sugar — I used granular in this low carb granola recipe, as it’s easier the find and typically less expensive. I love low carb recipes that are paleo as well — and this paleo granola is just that, thanks to the coconut oil! Many low carb granola recipes use butter, which you can use if you’d prefer. I opted for coconut, as I love the taste it adds in conjunction with the unsweetened coconut shreds. 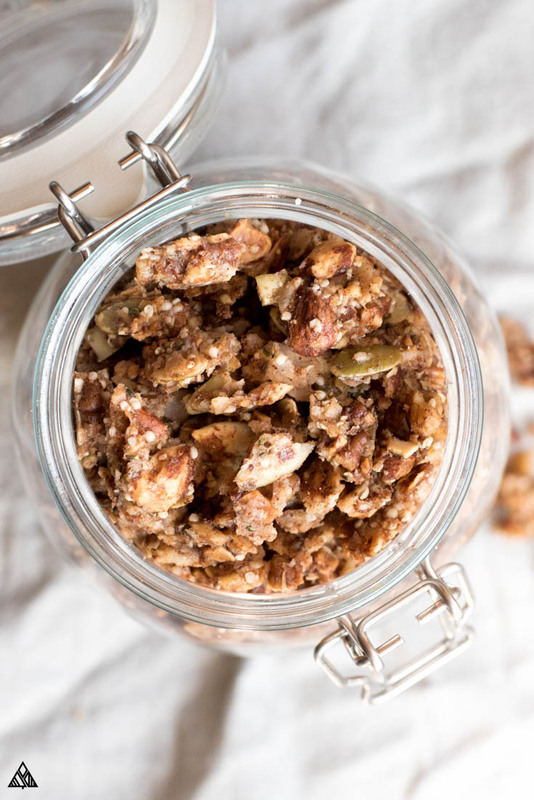 Swap the erythritol with honey and you’ve got a paleo granola any caveman would be jealous of! If you’re eating low carb and paleo, keep in mind that honey is full of sugar and carbs! 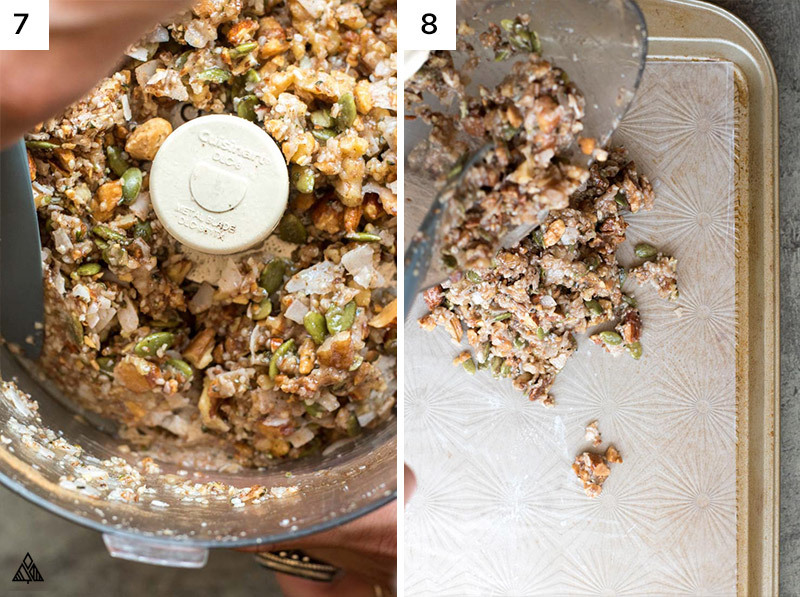 Half the fun in eating this keto friendly granola recipe are the toppings! Sorry to say, you probably should avoid chocolate chips and marshmallows if you’re sticking to low carb foods — but that doesn’t mean your keto granola recipe will be any less tasty! On top a bowl of low carb greek yogurt. Be sure to read the labels, as not all Greek yogurts are low carb! I stick to Fage or Trader Joe’s brand. With low carb milks: Almond milk, coconut milk, whatever you’re craving! With low carb fruits: Especially berries, yum! Freezer dried berries without added sugars. This will add some carbs, so make sure it fits within your carb count. Trader Joe’s and Whole Foods both sell these! Low carb chocolate. Break chocolate into chunks before adding it in to the low carb granola. Low carb peanut butter. I mean, duh, peanut butter makes everything taste better! I’m curious to see how peanut butter powders would work in this recipe? If you try any of these variations, or one of your own, let me know in the comments below! That’s right, there’s such thing as a savory gluten free granola, and it’s AMAZING! Think of it as the missing breadcrumbs in low carb recipes. It’s surprisingly amazing! You know I love to low carb meal prep! Which is why I make a double batch of this low carb cereal at the beginning of the workweek, and enjoy it for breakfast every morning. Which means, before I start my busy workday, I get to hit the snooze button, don’t have to dirty any dishes, and still get to enjoy something as delicious as this low carb granola! I switch up the toppings and mix ins so I don’t get tired of it. Low carb granola is officially my new favorite breakfast for meal prep! Does anyone miss granola bars like I do? I miss and crave that crunchy sweetness as a midday treat! The perfect grab and go snack, or dessert after a savory meal. I’m currently testing low carb granola bars recipes by switching around the ingredients in this low carb granola — I’ll keep you posted as soon as I work up a recipe that’s worth repeating! 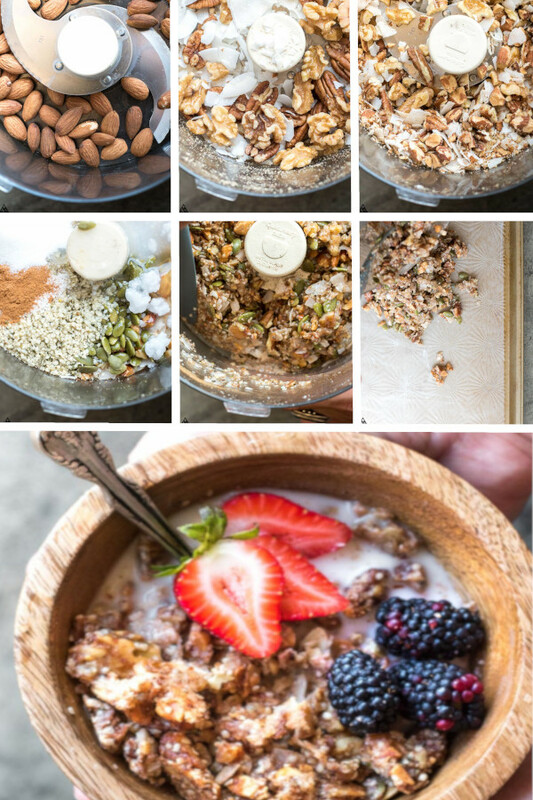 I hope you enjoy this low carb granola recipe as much as I do! Leave a comment and let me know what you think! Did you try any variations? What did you top your low carb granola with? Enjoy! 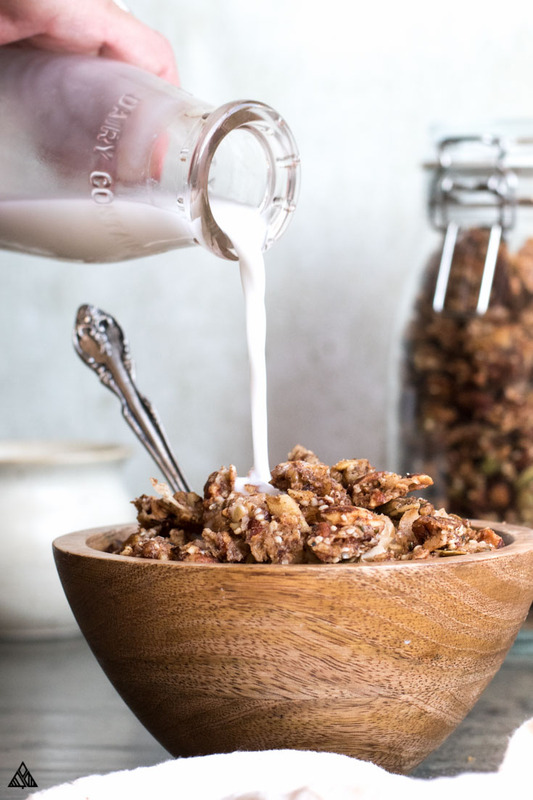 This low carb granola cereal recipe is the most delicious, addicting and crave-able combination of ingredients you’ll ever eat out of a bowl! Enjoy it with milk, yogurt and low carb fruit for a breakfast that's worth getting out of bed for. 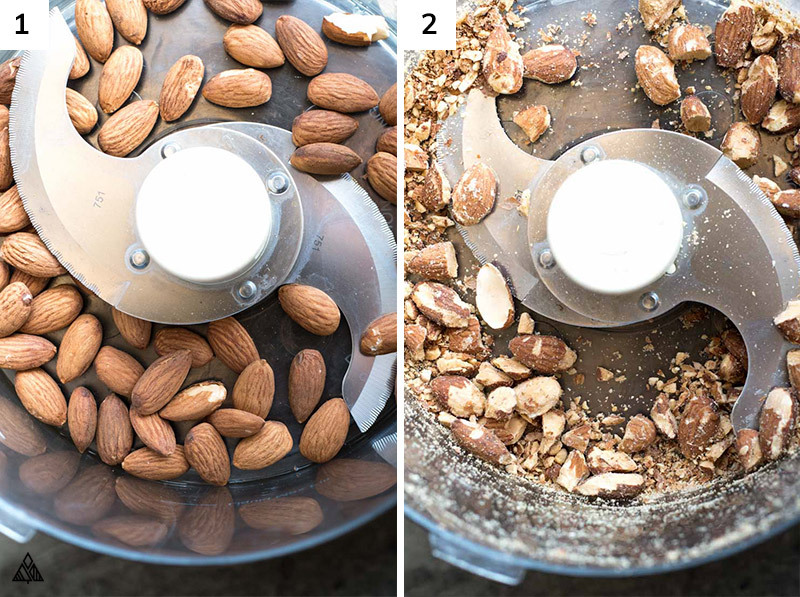 Add the almonds to a food processor. “Pulse” 20 times. 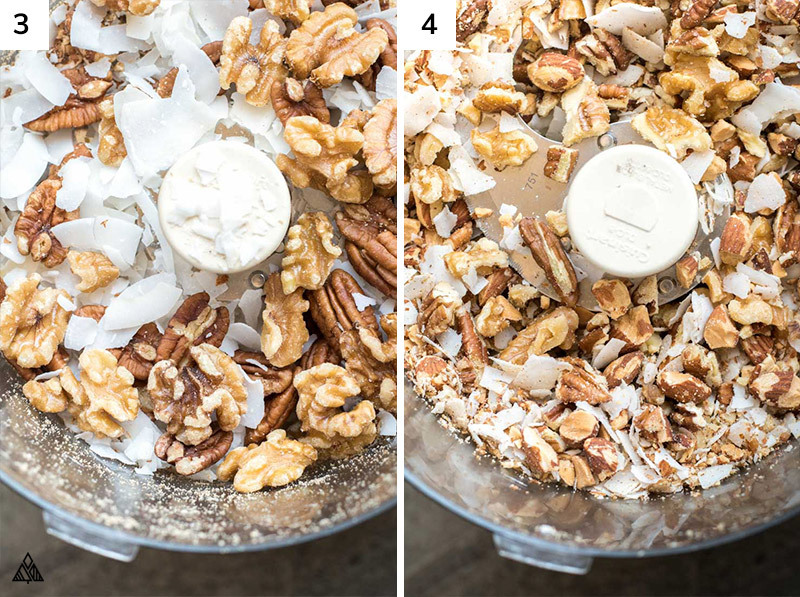 Add the walnuts, pecans and coconut to the food processor. “Pulse” 10 times. Add the rest of the ingredients, “pulse” 3 times. Using a spatula, clean off the edges of the container to incorporate everything, then “pulse” 3 more times. Spread in a thin even layer on a lined baking sheet. Bake for 7 minutes, then rotate the baking sheet in the oven. Bake for 8 more minutes. You’ll know the granola is done when the edges start to brown and your house smells delicious! Pull from the oven and allow it to cool. 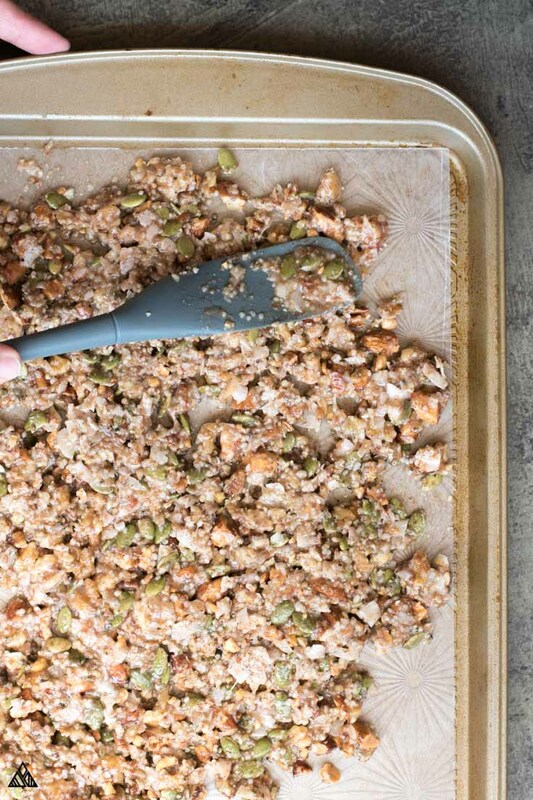 Using your hands, break up the granola into bite sized pieces. Store in the fridge, and serve with low carb milks, low carb fruits or low carb greek yogurt. Enjoy! Pst, those of you looking for low carb granola brands, I just stumbled on this Pro Granola, a low carb high protein granola with 12 grams of protein 2 grams of net carbs. Has anyone tried it yet? 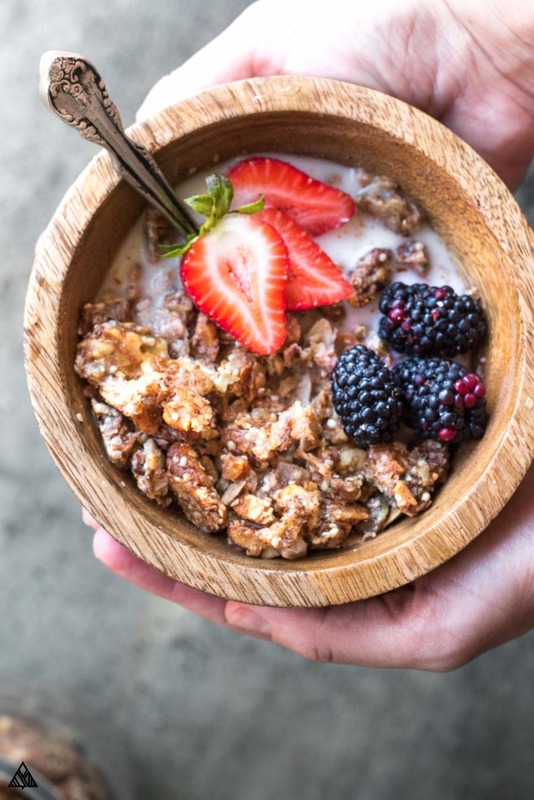 If you aren’t sticking to low carb foods only, check out this list of gluten free cereal brands — you’ll be shocked and excited! I can totally see myself munching this all day long! Lovely recipe. Thank you for posting this recipe. While all the information is very detailed and thorough, I can’t find (and maybe I missed it) the SERVING SIZE. All of the nutritional information (protein, carbs, vitamins, etc. etc.) is here, but not the serving size. Doing a rough calculation based on the recipe amounts, I’m guessing 1/4 cup. Is that right? Yikes!